Humana Day is an annual event involving international partners and friends of the Foundation. Its purpose: to spread the work of the Federation Humana People to People and organizations that form. The woman at the center of development of the planet is the topic of the speech and debate Humana Day 2012, taking place internationally on 27 September. 'Women in Action' is the slogan that accompanies the logo and all other communication media. 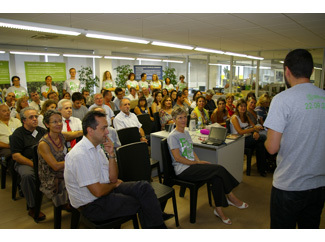 The Humana Day 2012 is part of the celebration of the XXV anniversary of Humana activity in Spain. Therefore, throughout the month of September, will take place various events. The first is the Open Day at the headquarters of the organization in L'Ametlla del Vallès, today September 13. Include delivery of III Textile Recycling Awards and a Seminar on Textile Recycling in order to provide more information on the benefits of promoting recycling clothing and shoes, showing specific examples of the type of products that can be made ? ?from textile worn. Another planned a small Exhibition on Cooperation that aims to show the reality of the communities where Humana conducts its projects through everyday items both for their work and their daily tasks at home. 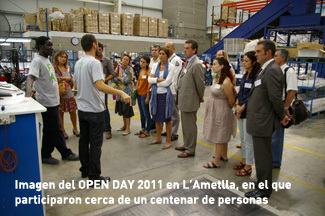 In case you want to attend the Open Day of L'Ametlla del Vallès, send an email to contenidor.catalunya@humana-spain.org. The Open Day will take place in Valderrubio (Granada), on 17th September, in Lisbon on 24th and 27th in Leganes (Madrid).